Just a couple of miles from Unicorn, Sale is the original home of Glebelands City Growers, who supply us with some of our organic vegetables and provide our amazingly fresh salad leaves – all year round. 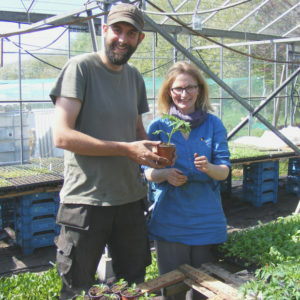 Glebelands is a small growing business run by highly skilled horticulturalists Adam & Charlotte, plus dedicated seasonal workers (several of whom have also been involved with Unicorn over the years). They supply Unicorn with produce from their 2.7 acre market garden in Sale and their more recent addition of undercover growing space in Stockport. Through the year you can expect to see salads, beetroot, chard, beans, courgettes, basil, coriander, parsley, spring onions and cucumbers, as well as some plants – tomatoes, herbs, etc. – to grow on at home. Glebelands also occasionally open to the public, check our board for upcoming events. Produce from our most local grower is always fresh and is often on the shelves within hours of being harvested. By cutting “food miles” (the distance food is transported) and using organic methods that do not rely on chemical input, local produce is better for the dinner table and the environment. Glebelands also close the recycling loop by turning any food waste from Unicorn into compost for use on site. Businesses like this provide a good lesson in recognising the real value of food. Glebelands Stockport site is at Woodbank Park, an ex-council plant nursery site not far from the town centre. As part of a project co-ordinated by Manchester’s Kindling Trust, the once under-utilised site is now home to a thriving blend of community growing, agriculture training and commercial production, creating a real ‘hub’ for sustainable agriculture in Stockport. Glebelands’ ongoing success and evolution is thanks to a highly skilled and incredibly dedicated team who not only not how to grow great veg, but also know how to grow a business. Over the years we’ve been delighted to support their strategic vision by providing grants and loans to assist with a borehole, a custom-built packing shed, and most recently an automatic ventilation system in their new Woodbank polytunnels; reducing labour needs, providing optimum conditions for crops and increasing the number of crops they can produce. The increased turnover this generates hopefully one day may mean that an above-minimum wage for the growers is a more realistic option.